Subjects covered: how much impact to sea ice from these warm atmospheric pulses into the Arctic. Their Causes and quantification of how much heat/water pushed into the Winter CAB. Do they draw heat from the surrounding ocean or bring heat in from mid-latitudes? Do they cause significant melt in winter or do they prevent sea ice growth (or both? ), Freezing Degree Day (FDD) Anomalies this season. From the observations of the indigenous people of the arctic, to comments made by Mark Serreze and all those made by the members of this forum, it is painfully clear that something has radically changed very recently, as in the last three to five years. The permanence of the changes, of course, is a "wait and see" question. In particular, I am interested in the large influx of heat, both via the atmosphere and the ocean. The atmospheric heat seems to be explained by higher amplitude Rossby waves and the influx via the Bering Strait has been attributed to the PDO. That said, the most dramatic heating seems to be on the Atlantic side. As I understand it, the THC brushes past Ireland and then heads westward towards Iceland where it interacts with the colder and fresher arctic water. It then subducts while releasing a lot of heat to the atmosphere. As the lower latitudes of the arctic warm, it would seem to me that the Gulf Stream would tend to continue north until it encounters colder water. There is a very deep trench east of Iceland that would facilitate this, extending up through Nares Strait into the CAB. As the incoming current would be at the surface, this would conflict with the large ice export seen through the Nares, but if the current went further east, it could enter the CAB on either side of FJL and then subduct into the very deep CAB and exit via Nares Strait. It could also just loop westward between Svalbard and Norway, into the trench south of Svalbard. This is all just my conjecture but I am having trouble finding any literature that discusses changes in the circulation path. I have found several articles about the NAMOC slowing down, but that's about it. The slowing down would fit, as there is a ridge from Iceland along a line dotted with the Faroe Is. and the Shetland Is. This may be marginally on topic for this years freezing season, but I didn't see a topic that was a better fit. Apologies if I am OT. Thanks, jai! It would've been a shame to let such a good discussion disappear. Yep, the 12Z GEFS, GFS, and EC are consistently going nuclear in 5-7 days. Seriously! A large part of the Atlantic side of the CAB will be above freezing for a day or two, not to mention the whole of the Barents sea and Greenland sea. It's going to be interesting to see the affect on the thin ice on the Atlantic front around Svalbard and FJL. Nominal, unless there is accompanying wind and wave action. The major impact will be to retard ice formation and weaken existing ice by warming it, and causing its internal structure to change. The high air temperatures by themselves will be unable to cause anything beyond trivial surface melt, perhaps a few MM at best. The air masses simply don't carry enough heat with them. Make no mistake, this is a pretty dire prediction at this point in the season, where so much heat has already interfered with ice formation. With continuing weather like this, we could see huge expanses of the Arctic finishing the refreeze season with less than 1.5M of ice. If this does turn out to be the case, it will require a miracle to avoid a catastrophic melt season. I'm following all available media though I do not produce enough work to post frequently. JDAllen, as I still stick to my dire 'black swan' prediction for '17, I see differences on the way toward that event. '16-'17 is not like last winter. It follows a different path. First three months were INCREDIBLE compared to any year. January not so. It will be revealing to see how the present Sudden Stratospheric Warming will pan out through February. Odds are still in line and ice accretion is bad over the whole season up to now. But Feb-April will be decisive on how severe this is going to be. with all due respect, this is not what the science has shown. for instance, this excellent presentation of the December 2015 warming event. also see: (note many links and supplemental documentation on this! Numerical experiments indicate that the warming effect of sea ice loss and associated upward turbulent heat fluxes are relatively minor in this event. This result suggests the importance of the synoptically driven warm and moist air intrusion into the Arctic as a primary contributing factor of this extreme Arctic warming event. I wonder if the hot air intrusions will continue during the melt season. links link to events that explicitly were related to warming jointly with storms and again he said that if that warmth will not happen together with strong winds that the impact will be minor. so you're both right, it just exists the possibility that the "without storm" thingy evaded you. if not, i'm sorry, i just got the impression that like so often we mean the same but fall for small but significant misunderstandings at times. Related with that warming event in about 5 days and beyond, look at the Scandinavian high at 1050+ hPa. Gee is that usual? (ECMWF last forecast for Feb 9th 12Z). All the coldness being displaced to North America and Central Europe as well. The way the Lows are set up over the next few days, they look like gears in a piece of machinery or pump, which exchanges surface air between the Arctic and mid-lats. My judgement is based solely on the raw energy available in the air, compared to the heat of fusion/melting required to melt ice. Fundamentally, the energy required to melt one gram of ice would raise the temperature of a similar mass of air 80C. If the ice is melting, the energy is *not* coming from the atmosphere, it's coming out of the ocean. Edit: to be clear - go back to my comment; I wasn't saying the ice couldn't melt. I said the "high" atmospheric temperatures were not going cause melt. If we have tubulence and turnover in the ocean, the heat will absolutely attack the ice. However, that energy categorically is *not* coming out of the atmosphere. What high temperatures do at this point in the year is not put energy into the ice; what they do is prevent energy from leaving the ocean. Note that the 2012 melt volume was around 19K m3. So -- in ballpark figures, if we only crest at 19K or just above, that sets up the possibility that we go near ice-free this year. It would require a whopper of a summer (2007 or 2012 level), but the chance is there. A persistence of the current anomaly would get us around 20K. Kind of gives an idea of how little margin there is left. I'm not convinced we'll melt out... yet. I'm in pretty close agreement with you though. There's some potential bad synergy here - as the ice is thinner, it will facilitate localized melt out which in turn will reduce albedo and increase insolation uptake. Considering that, I don't think we'll need a bad a year as 2007 or 2012 to go very low. At this point, I"m fully expecting SIE and SIA to drop under 2 million KM2. Again, unlike previous years, my concern isn't that we'll have weather that will kill the ice; it's that we won't get weather that will save it. This weather pattern is really rockin' Nares Strait, with 63 km/hr wind and 3.29 m waves. I don't know if you can call it a polynia where it is, but whatever the clearing is called is getting bigger. The ice in Baffin Bay is losing concentration and loosening up. If this continues, don't be surprised to see Baffin get flushed entirely, as the wind in the near future favors it. I'm sure there's going to be a flurry of research on this winter soon. well that's just dumb Melt during a warm storm event has been documented in these and other locations. please review before you make your assertions. I understand that, and this is not a correct statement, heat fluxes into the arctic by the atmosphere during the winter are at least 5 (and this year probably 10) times MORE heat energy than ocean-borne heat. The question is not whether the atm is driving melt (during these events) it is how much. What about water vapor? you are using dry-air specific heat, these storms raise precipitable water vapor from 1kg/m^2 to up to 12kg/m^2, This extra warm air/water mass is blowing in at 45 km/hr and eventually covers an area of over 3 million square kilometers. There is more than enough heat intrusion to produce sporadic surface melt. The nasa video shows this and you should also consider that first-year higher salinity ice melts with less heat in your estimation. this is an interesting statement I prefer to look at sea ice surface energy balances, not ocean exchange. probably a good idea to review again: http://www.colorado.edu/geography/class_homepages/geog_4271_f10/lectures/week_2.pdf This shows that heat from the atmosphere is the dominant force under NORMAL conditions. jai - what you've bolded is an answer to the question (in the specific instance in question): Was the atmospheric system caused by sea ice loss or did sea ice loss cause the atmospheric system? It says nothing about warm air melting (or not melting) ice. [Judah Cohen] challenges Jim Overland's assertion that Arctic reinforces but cannot drive circulation change. Plenty to discuss later. Warm air will melt ice, but water and insolation play a far greater role. 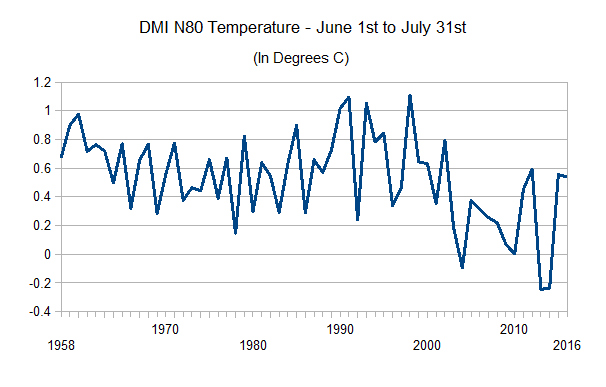 What few people realize is that over the same period we've seen decreasing extent and volume, the two warmest months of the year (June and July) show a decreasing trend in N80 temperatures. Yes, June and July are cooler now than they were in the 60s, 70s, 80s, and 90s. I have postulated previously that the reason for this change is an increase in open water during the melt season and that the newly opened sea water is *colder* than the ice and melt ponds it has replaced. And since the air will assume the temperature of the ice or water beneath it, a decrease in sea ice can actually lead to cooler air temperatures. Forgot sth. Ice is immobile compared to atmospheric masses flowing for days with the same temperature. I understand the topic is under debate. The reference indicates that the warmth of the event (and the associated observed melt) is due to intrusion and not dominated by heat flux from the oceans. yep, and the indication is that if the piomas anomaly is continued (It will) into the latter half of the freeze season we will likely see some growth above previous 'normal years' at that time, though (I feel) not enough to overcome the anomaly. Cause and effect reasoning isn't particularly perceptive when dealing with non-linear coupled processes. The warm Atlantic water in the Barents sea and north of Svalbard amplifies atmospheric blocking over northern Europe. There may also be an atmospheric teleconnection to the Pacific because the flow of Siberian air into the western Pacific is enhanced by the blocking over northern Europe. Thus troughs are deepened off the coast of Asia and mid Pacific ridging may be enhanced. We have seen very strong planetary wave number 2 activity since November. Moreover, we seeing slower thickening of Arctic ice this winter in part because clouds and water vapor are reducing outward longwave radiation over the Arctic ocean. In winter, it isn't an issue of warm air melting sea ice. It's an issue of clouds and water vapor slowing the increase of thickness of ice across the Arctic. No audio? While I generally understand what the video is presenting, (temperature changes, atmospheric flow, changes in ice coverage), its not explaining where the energy is coming from. I'm also currently digesting the paper, which may give me some more insight regarding the questions I list below. So here's the challenge I'm having with your argument; I'm still not seeing where the atmosphere has enough energy to produce the melt. How much latent heat was carried into the region (net enthalpy and implied by carried water vapor)? How much of that radiated out of the atmosphere? How much heat which would *normally* be re-radiated went into the ice instead? What was the volume of ice melted and how much energy would it require for melt? The narration still doesn't provide either an indication of where the energy came from, or measurements which imply the transfer of heat melting the ice actually came from the imported heat. I'm reading further looking for such. Haven't seen it so far. Still sounds hypothetical. She says specifically at time :30 "transporting unseasonable heat and moisture into the Arctic from lower latitudes". Yes, I heard that as well. However, it does not indicate whether that heat was sufficient to cause the melting, nor whether it was the source of the heat that was taken up to cause the melt. Mostly what it implies to me is that it disrupted the radiative mechanisms that previously and normally were in play. Also missing from the video are the immediate temperatures. We had anomalies of up to 30C; however, across much of the region including the margins where melt was taking place, temperatures remained close to zero. In some places, that anomaly brought temperatures barely *to* zero. That's not a lot of gradient for heat transfer in the quantity required for melt to take place that quickly. Let's talk about downwelling radiation as well. Some of that will be native to the air masses entering the region, supported by energy released by moisture going through multiple phase changes as it eventually leaves in the form of precipitation as rain or snow. No where do I see suggestions that this was sufficient in quantity to cause melt. *Further* because of the green house effect added by that moisture, a significant component of that downwelling radiation comes not from that carried by the atmospheric inflow, but rather is radiation captured from the sea or ice surface by atmospheric moisture. The question is still begged whether that would have been enough in both quantity and rate to cause the kind of melt we saw and are seeing. So, my observations are obviously qualitative rather than quantitative. I'll happily concede if actual measurement proves my analysis incorrect. (Dang it, I forgot to include the scale in my snap shots. For those not familiar with the web site, in the anom. image, the brighter the red, the greater the anom, with most of the central red region over the Barents running 20C+ above normal. In the 2nd image, the blue/green interface represents the zero C line, with bluer to purple being coldest). jai - You seem to be arguing that the air temperature is melting the ice whereas the paper is arguing that a cyclonic mass of warm moist air melted the ice. Their argument is not your argument. Figure 4 shows the net SEB plus Downwelling Longwave Radiation, Sensible Heat, and the Latent Heat components of the equation. And the effects of air temperature are not disambiguated from the effects of humidity, nor cloudy skies vs clear skies. It's also worth noting that temperatures increased 3σ above the 2003-14 mean while humidity increased 4σ above the 2003-14 mean during the storm. Relevant to the current discussion of how much heat the atmosphere may be providing to current melt happening during storms. 1/1/2016 precipitable water in KG/M2. This is relevant as it represents even more than temperature, the absolute quantity of heat available for release. 10KG of H2O represents enough water to form a plane 1CM thick on a square meter of some surface. That means, the theoretical maximum heat available when an influx of moisture typical to what we see currently takes place (10-15KG/M3), that has a net enthalpy to force a phase change (twice - heat gets release when it precipitates as water, and again when that water freezes) of between 1-1.5CM of ice per M2. So again, considering that won't all be translated into downwelling longwave radiation, but at the point of emission least half will end up heading out of the atmosphere, we are talking about perhaps 1CM of total melt potential. Add that, not all of that energy will be going into a phase change but rather will be dispersed into other heat sinks - like the ocean itself. What's left over is very much in line with what I asserted - the energy available in the atmosphere would be sufficient only for very minimal - a few MM - surface melt of the ice affected. The energy necessary to destroy anything much past nilas *must* be coming from somewhere else. the energy available in the atmosphere would be sufficient only for very minimal - a few MM - surface melt of the ice affected. over a multi-day event this is quite significant. note: also the spatial and temporal forcings are not distributed but rather impact local areas. Hey Jai .... That was fast!! looking at the basics, unless the temperature goes above 0deg or -1.8 in the presence of saltwater, any amount of heat released won't cause melting full stop. Condensation could cause a lot of melting at 0deg, i.e. the air would not have to be warmer to cause more melting it could just bring more moisture (although the amount of moisture any m3 of air can carry is of course limited by its dewpoint. We have looked at buoy data in the buoy thread in that context. When it comes to radiation, only something which is itself warmer that 0deg can bring the temperature of something else above 0deg. Unless there is another heat input with temperature above 0deg and we are talking about reduced heat loss (not happening in this situation). I don't think there is an argument for actual significant melting taking place in January 2016. But of course reduced freezing at that time did result in increased melting later. What I would like to know, but must be hard to get data on, is whether there was increased precipitation (snow) which affected rate of cooling and melting in different ways later. Sleep is for the weak, no rest for the wicked! Well, the similar event at hand is starting in 48h and according to the 12Z gfs run it might be sustained and bring high temperatures for days (note the animation shows 2m air temperature, the 0C line well marked in red dividing green and blue). Maybe the whole discussion should be moved to a science thread? I realize it touches on the current melting season, but the scope is wider, and it's becoming long. I can let it rest for the moment and leave Jai with the last word. As seaicesailor suggested, we should watch the next coming storm with great interest. Regardless of where the heat is coming from, it will be trouble. RE: Relative importance of energy transport into the Arctic via atmospheric or oceanic processes. I have just popped into this thread, so please forgive me if anything I say below has already been voiced further up the thread. Taken as an annual average, virtually no parts of the planet are in radiative balance. In equatorial regions, the energy contained within the incoming solar radiation considerably exceeds that contained within the outgoing long wave radiation, whereas at high latitudes, the converse holds true. The overall planetary balancing act is performed by poleward (often referred to as meridional) energy transfer by the atmosphere and by oceanic currents. My memory (a fickle beast at the best of times) suggested that, as regards energy flows into the Arctic, the atmosphere transported roughly twice as much energy as the oceans. Thirty minutes spent flicking through my text books failed to reveal the source for this "memory", so it was over to Mr Google.
" The overall picture is that at very low latitudes the polewards energy transport in the ocean exceeds that of the atmosphere, but in mid-latitudes the atmospheric transport is two or three times that of the ocean." I hope that might help to provide some clarity to the ongoing debate. Amongst the co-authors of that paper, many (most?, all?) of the readers of this thread would recognise the names Mark Serreze, Andrew Slater and Kevin Trenberth. my pleasure Neven, we are learning so much from each other in this wonderful exchange you have provided for us! Reviewing this exchange, arctic is the elephant and we are the blind try to describe it. We have incredible power and resource that is directed toward this. We post the information that we find from the collective efforts of thousands of very smart individuals who actually spend their life's work studying this. The problem is that these conditions are changing so rapidly now, the future conditions impossible to accurately quantify, we are blind conductors passengers on a runaway bullet train. Thanks for moving that over Jai - I was about to do so, but saw that you had beaten me to it. Still, it is a big puzzle. I agree that a lot of very smart scientists are generating the puzzle pieces and have been spending countless hours and years doing so. Doctor Jennifer Francis provides a discussion of the intense Arctic amplification and water vapor anomalies that occurred this year as a result of the record El Nino of 2016. Every indication is that this pattern will become the 'new abnormal' as a result of global warming and, especially, as a result of reductions in SO2 emissions from SE Asia. - As the Arctic heats up, sea ice melts, exposing regional waters to sun, air and increased evaporation. - As the planet warms, humidity increases more in regions closer to the equator. This creates an imbalance in global humidity, and eventually, moist air from lower latitudes is drawn into the drier Arctic. I'm not sure where to put this but I thought maybe I'd get an answer here. Planck's law of black body radiation is an exponential function of temperature. The greenhouse effect means that radiation from the earth is less than irradiation from the sun. This can only rebalance when the earth heat's up. But melting ice absorbs heat without raising the temperature. Doesn't this mean that if heating goes up even a small amount the process will continue until the ice is melted unless local heating, before the heat can make its way north and melt the ice, is enough to increase radiation enough to balance out again. So there must be a point where the inefficiencies of the process of heat moving to the poles and melting ice are not enough to raise the temperature locally enough to return that balance. Isn't that the decisive tipping point? I think you mean "quartic" rather than "exponential" But yes, we are in radiative imbalance. Radiative imbalance is measured at top of atmosphere, not at surface. Ice melt will tend to stabilize T(surface) at the poles where the ice is at zero C. But that is not the emitting surface. Great lecture, thanks for this. Made me feel sorry for meteorologists though, for a few seconds.